Get to work quickly and efficiently with this fully assembled vacuum cleaner, which features a Twin Chamber bagless system that helps maintain maximum power while trapping dirt in sealed chamber for convenient disposal. Bagless system has Teflon¨ coated HEPA filtration. For heavily soiled areas, utilizes the multi-speed PowerSurge. 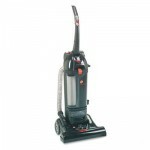 Get to work quickly and efficiently with this fully assembled vacuum cleaner. Features a Twin Chamber bagless system that helps maintain maximum power while trapping dirt in sealed chamber for convenient disposal. Bagless system has Teflon¨ coated HEPA filtration. For heavily soiled areas, utilizes the multi-speed PowerSurge. The 15″ cleaner width is great for taking on large, commercial cleaning projects. Hush¨ Mode allows you to operate at a quieter noise level–great for cleaning in close quarters. Easily lowers to 180 degrees, making it adept at getting under beds, tables and desks. Includes one commercial upright vacuum cleaner.